This rare political cartoon celebrates the Union victory in the Battle of Antietam, by depicting the bloodbath as a boxing contest between Confederate General Robert E. Lee (labeled “Charles” Lee in reference to the Revolutionary War traitor) and Union General George McClellan. 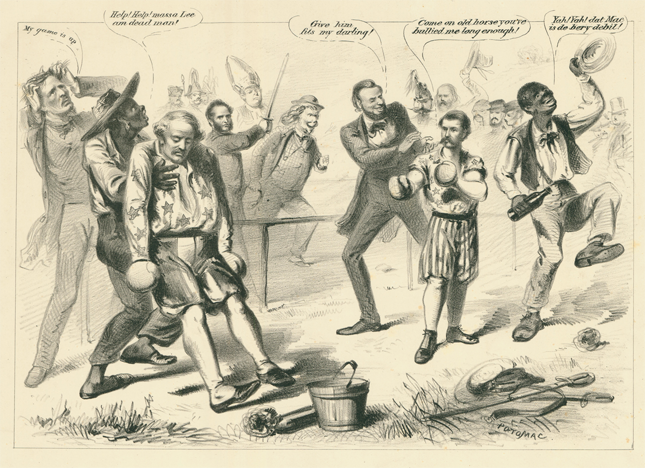 European leaders watch as Jefferson Davis exclaims “My Game is Up” and Abraham Lincoln encourages his champion to “Give him fits my darling!” The handlers are African Americans, and Lee appears ready to throw in the sponge. The printer is unspecified, but it was issued by Wilkes’ Spirit of the Times, a New York publication that appealed to upper class sports aficionados. More details and a larger image are on our website.